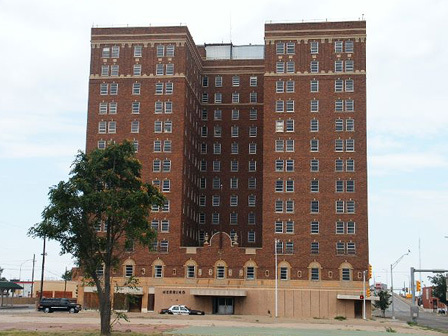 The Herring Hotel was one of three oil-boom era hotels built in the 1920s, and is now the only one standing. It was the largest of these hotels, and was home to the famous Old Tascosa Room where cattle and oil barons gathered to discuss business and unwind. The room featured western frescoes painted by noted muralist and artist H.D. Bugbee. Now only one of the frescoes is intact after a water main flooded the basement several years ago. The hotel’s 14 stories and 600 hotel rooms made it the largest of the 1920s era buildings. Its builder, Cornelius Taylor Herring, was a pioneer cattleman, oilman and banker. He also owned 98,000 acres of the LS Ranch north of Amarillo. The Hotel was converted into federal office space in the early 1970s, but was abandoned a short time later. The site is vulnerable to vandals and damage from the elements.